Indie Philanthropy is a creative disruption to the status quo of funding. It gives a common name to decentralized, daring funding alternatives that together are poised to reshape the field of philanthropy. Some Indie Philanthropy practices have been around for decades, while others are emerging in real time. From crowdfunding to giving circles to community-based decisions to funding start-ups, the landscape of Indie Philanthropy is varied and exciting. Indie Philanthropy approaches are bringing radical ideas into the mainstream, changing the face of philanthropy, and adding much-needed diversity and creativity to the field. Indie Philanthropists are looking closely at not just WHAT gets funded, but also WHO makes decisions and HOW funding is done. We care about philanthropic culture and want the WAY we give to mirror the healthier world we seek. On the growing edges of the field, many of us are funding innovation often overlooked by mainstream funders. These risk-takers are shifting our culture and institutions toward bold, vibrant solutions. To drive experimentation, we embrace unconventional tools to support hard-to-reach emerging visionaries and welcome ‘failure’ as part of learning. Many of us believe deeper collaboration is the emerging currency: instead of seeing grantees, we see partners. We are consciously reducing funder-grantee power imbalances, inviting communities we support to the decision-making table, and encouraging more empowered community-driven giving. Many of us are committed to doing the inner work of clarifying our deepest values, real motivations and highest intentions, so that our outer work can be honest, aligned and successful. We are looking at all our resources –investments, influence, relationships, and grants – and leveraging them for change. With social, economic, and environmental challenges escalating, time is of the essence, and we are in need of bold alternatives. Traditional philanthropy has sometimes fallen short in addressing our global challenges–helping mobilize only a fraction of our world’s creative talent – and with the wrong approach, we can do more harm than good. Within mainstream philanthropy, certain types of organizations receive the lion’s share of the giving pool. Indie Philanthropy helps break open the funding space to give power and voice to a wider, more diverse array of innovators. By giving ourselves a common name, Indie Philanthropy is magnifying the power of people inspired by Indie values to re-imagine funding and embolden mainstream and new funders to try creative grantmaking approaches. Why is Indie Philanthropy particularly relevant for Human Rights funders? Indie Philanthropy themes – such as trust and balance in relationships, collaboration, experimentation, innovation, and responsiveness – can help create better funding practice in any field. An Indie lens is particularly relevant for human rights funders given the often risky and opaque contexts in which they and their partners work. Indie Funders place high value on building authentic partnerships based on trust, which is critical during periods where communication is difficult or impossible, when projects shift radically and results vary wildly. As rights funders know, meaningful change does not necessarily follow a linear path of impact. Evaluating the impact of human rights work is certainly not easy, and the rigorous data-driven metrics used by many funders are not always appropriate. More and more Indie Funders are looking beyond narrow causal relationships (expecting to see the direct result of each dollar granted) towards a more holistic view, which understands that radical change is a complex process involving the interplay of multiple groups and strategies within a broader ecosystem. They understand that no single organization or individual grantee can singlehandedly – for example – dismantle an oppressive social structure. In the human rights field, large NGOs with the biggest communications budgets often get most of the attention, credit for impact and, therefore, funding. Yet their success is so often built on the hard work of local, grassroots human rights groups and individuals who are on the front lines day in and day out, operating with much smaller budgets. These important groups are often overlooked by, or outside the reach of, mainstream philanthropy. Who, what work, or what regions are not being funded? Why is this the case, and how can we change it? Who makes the funding decisions, and can that shift to disperse power and create different and meaningful impacts? How is the funding process being carried out? Can we make it any easier and less burdensome on our grantees? Human rights funders can explore different types of funding practices based on the contexts in which they work. Our website has a whole host of resources to help funders determine which methods of creative funding might best suit their needs. Finally, an Indie Philanthropy lens encourages human rights funders to reflect on whether their investments, source of funds, or sourcing practices are in any way linked to the very problems they are seeking to address. The Indie Philanthropy stories from Amazon Watch, the Astraea Lesbian Foundation for Justice , Global Fund for Women, and IDEX, are wonderful inspiration points for human rights funders to jump off from. 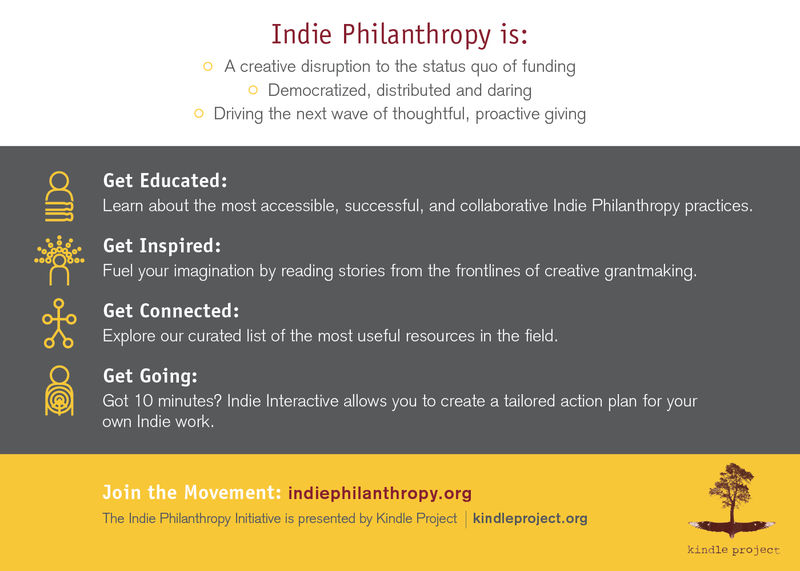 What is the Indie Philanthropy Initiative? Kindle Project, which has been experimenting with various forms of Indie Philanthropy since it began in 2008, is the spark behind the Indie Philanthropy Initiative. The Initiative aims to build an Indie Philanthropy community of practice and give a common voice to an emerging field. As part of this Initiative, we’ve created the first online donor education tool to act as a nexus point for multiple methods, stories and tools on how to practice unconventional funding. We are highlighting all things Indie–what is new and trending, funding methods that have evolved over decades, and emergent tools yet to be created. We are also in the early stages of forming a Learning Community for Indie Philanthropy–a group of people, funders, and those that work in philanthropy who want to dig into some of the topics and issues that arise when practicing creative grantmaking. If you’re interested in being a part of this group, please be in touch! Want to get involved in Indie Philanthropy? Click here to see how! And don’t hesitate to drop us a note if you have ideas, questions or resources to share: indiephilanthropy@kindleproject.org.